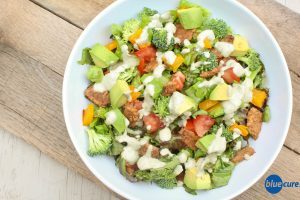 Here’s a healthy- spin on bacon & ranch salad. 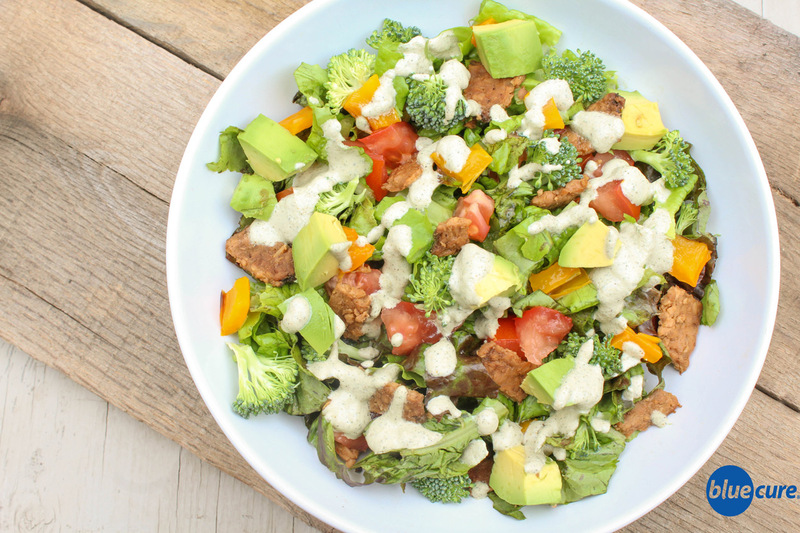 Swap in some plant-based bacon, such as tempeh bacon, and use pumpkin seeds for the base of a homemade ranch dressing! Serve this as a tasty side salad or toss in some cooked quinoa or roasted sweet potatoes to make it a meal! In a blender, combine the pumpkin seeds (or cashews) with water, garlic powder, onion powder, dill, celery seed, salt, and pepper. If using the cayenne and apple cider vinegar, you can add these too. Start with less water and add more as needed. Avoid making it overly watery by just pouring a small amount of water in at a time. Blend the ingredients together until smooth. Optional to lightly sauté the plant-based bacon in a skillet to crisp it up or just serve it raw. Divide the veggies into bowls. Chop the plant-based bacon and add. Drizzle with the pumpkin seed ranch dressing.